On the Way - Grant Foster (center) leads the way at the start of the 2007 Napa Valley Inline Marathon. Mike Anderson broke away from the lead pack six miles from the finish line and skated to a commanding victory in today's Napa Valley Inline Marathon in Calistoga, CA. Naomi (Shechter) Patino returned to the event after a year's absence to regain the women's crown. Lizzy Loeb was second; Barrie Hartman, third. The men's race was decided by a small, hard-working lead pack that formed shortly after the start of the race. The pack set a fast pace on the hilly road course and never let up. "It was way different than other races," said one of the leaders, Andy Zak of Las Vegas, NV. ""Everybody took turns and we pushed hard all the way." By the midpoint of the race, the number of skaters in the lead pack had dwindled to five. The number held until just after the final turnaround when the skaters hit a patch of torn up pavement, 6.5 miles from the finish line. "When we got to the rough section, Mike (Anderson) just started skating," said his Bont North America teammate Grant Foster. Or as Anderson put it, "I just put my head down and kept going." Of the skaters in the lead pack, only Foster was able to keep up. But not for long: he soon fell off the pace, and Anderson skated the final miles of the race alone, occasionally standing up and glancing behind him to look for the chase pack. The 40-year-old computer programmer from Minneapolis, MN, won the race in a time of 1 hour, 18 minutes and 42 seconds. He finished 58 seconds ahead of Foster, a geo-technical engineer from San Jose, giving Bont North America the top two spots on the podium. Zak led the two-man chase pack during the final miles of the race. But Foster passed him in the sprint and went on to beat him by seven seconds. Dimon Sport's Andrew Love finished fourth; Team Safe's Rob Motta, fifth. A few miles from the finish, Patino broke away from the pack with one of the male skaters. He got away from her, but she pushed the pace and finished strongly, 1 minute and 14 seconds ahead of Loeb. Hartman was another five minutes back. As Patino finished, her 4-month-old son, Thomas, snoozed in a car seat along the side of the road under the watchful eyes of family members. One of the interesting sights on the racecourse was the odd, dove-tailed stroke of Miyshael Gailson, who raced on a one-wheel skate of his own invention. The Reno man said the skate was the result of divine inspiration he received in 1988 when he was transitioning from cross-country skiing. He skated the half marathon in 1 hour, 52 minutes and 4 seconds, according to the official results. "This could be considered an unofficial world record," he said. Why? Because as far as he knows, no one has ever skated a marathon before on a one-wheel skate. Backward skater Jack Fong of San Francisco was disappointed with his race today. Last year, he skated the half marathon backwards; this year he wanted to complete the full marathon. But after nearly three hours of "back skating" and with a mile left to go, race officials told him he would have to finish the race skating in the usual orientation because the racecourse was closing. He finished the race like everyone else, skating forward. "I don't even want it to count," he said. 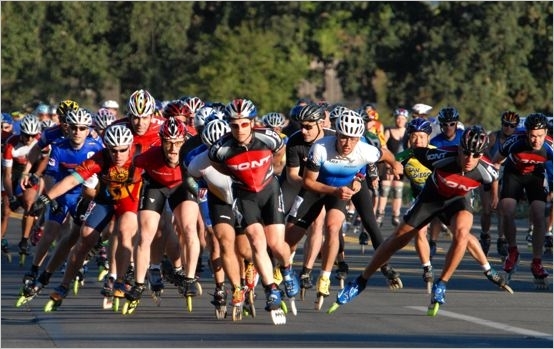 The Napa Valley Inline Marathon is an annual event organized by the California Outdoor Rollersports Association (cora.org). This year, 140 skaters attended. • Talk about this story!